094 Intersolar N.A. - Know Before You Go! Welcome to Episode 94 of SunCast! 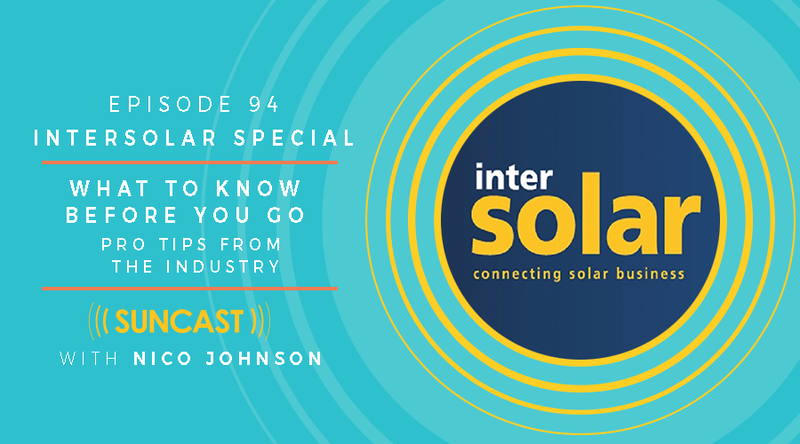 Today's episode is all about Intersolar N. America, but the lessons here can apply to virtually any tradeshow or major industry event. We kick this episode off with a conversation with the Managing Director of Solar Promotion, the company that puts on the Intersolar and EES conferences globally, Mr. Florian Wessendorf. Stay tuned after that as we have some cameo appearances from SunCast listeners, Twitter followers and more all geared to helping YOU better understand: What to Know Before You Go. The key reasons you should attend Intersolar, from the guy responsible for making it happen. Today's episode is brought to you by CPS America (aka Chint Power Systems), the USA market-share leader of 3-phase string inverters with over 2GW shipped in America. Today on SunCast, we are going to explore once again the world of Solar Plus storage in a conversation with a seasoned solar entrepreneur who's turned his sights to what he believes is the logical evolution of our industry. JW Postal has had by any measure a successful run as an entrepreneur, not just in the solar industry. As a co-founder of Main Street Power, he helped build the company to become one of the largest DG players in the US, eventually being absorbed into the global giant AES as their first foray into distributed generation. He has now turned his sights toward the impending boom of the storage business, and today we gain valuable insight into how this entrepreneur is setting himself apart from the pack. Welcome to Episode 92 of Suncast! Today on SunCast, we are spending time with a fellow Solar Warrior who's been in the trenches since the 90's and has developed a great business helping solar developers hone in on and tighten up their process. Stephen Smith is an entrepreneur and solar developer from the SF Bay Area who had the good fortune of being able to walk to work back in the early 2000's when he was hired on to a then-unknown Berkeley-based solar company - Powerlight. Stephen has since managed Gigawatts of solar installations, and provides his customers and the market generally a path to predictable & effective project execution. Welcome to Episode 91 of Suncast! Today's episode is focused on a tool that you can use to help you in your solar PV module procurement process, a free report produced by Tristan Erion-Lorico and his team at DNV GL called the PV module reliability Scorecard. The 4th generation of the Scorecard was just released, and it's a fantastic benchmark to help you understand how to avoid some of the common pitfalls experienced by developers of all sizes when buying solar PV modules. What core elements make up a bankable and reliable Bill of Materials (BOM). What the key contributors to solar module degradation are. The one ingredient in a solar module that made a 12% difference in production results for one of the manufacturers on the report. The one thing that is essential prior to your PV module purchase. Hey Solar Warrior, and Welcome to Episode Number 90 of SunCast. I'm your host, Nico Johnson, and I'm so glad to have you back. Every week, SunCast provides tomorrow's cleantech leaders with insight and ammunition to carry you through your daily battles. If you missed Episode 86 or last week's Patreon launch, I'd like to invite you to Join the SunCast Tribe. If you believe in the value of what SunCast brings to the world, please check out that episode, and then head over to www.mysuncast.com and click on the Become a Member button to learn more. A special shout out to Tribe member Frederic Rivollier up in Ontario, Canada! We're going to be opening up the private facebook group next week, and I am also toying with bringing the Tribe members into my private Slack group where I congregate with past guests of SunCast. I'd love your feedback Solar Warrior, do you use Slack? Would you prefer a Slack group over Facebook? Today on SunCast, we are demonstrating the value of being engaged in the SunCast community. Tristan Erion-Lorico is a dedicated listener to the show, and this episode in part spawned from his reaching out to make some suggestions for improving the show. But more than that, he has a fantastic career story for those of you who might feel like you're not on the Jigar Shah or Dan Shugar trajectory. He's ascended to one of the top roles in his field, one where the majority of his peers have a PhD, and I think even many of his colleagues would be surprised to learn his formal education level. You see, it's not always about the degrees and titles. Tristan, like many of you, is an infinite learner, and he attributes that as one of his keys to growth and career success. Along the way we discuss how having a family early in his life pushed this hustling kid-entrepreneur into the corporate world, and how his curious spirit and eagerness to grow has propelled him to be Head of the Solar Module Business Unit for one of the most recognized engineering firms in the solar industry, and arguably in the world - DNV GL. Thanks again Solar Warrior, for setting aside THIS time in your day. Please enjoy this week’s episode of SunCast, with Tristan Erion-Lorico. Welcome to Episode 89 of Suncast! Today's episode is Part 2 of an interview with Josh Weiner of SepiSolar, so if you didn't listen yet to Episode 88, I would recommend you start there. Also, did you check out last weeks episode where I give you the chance to join me in helping build Suncast? If not, Listen to it here! You can learn more about becoming a member of the Suncast Energy Tribe by watching my video here! Today on SunCast, we continue to dive deep with Josh Weiner the CEO/Founder of SepiSolar, a SF Bay Area engineering services company that specializes in the integration of energy storage with solar. Josh is the CEO/Founder of SepiSolar, a Bay Area engineering services company that has taken a long view on the integration of storage with solar. Josh began his solar career at Akeena Solar, one of the leading turnkey residential and commercial solar contractors from 2002 to 2009. Shortly after joining the Akeena team in 2005, Joshua quickly took on a supervisory role within the company’s operations departments, opening several remote offices nation-wide and scaling the company’s staffing and infrastructure needs upon Akeena’s IPO filing. Josh was sincerely one of the most interesting and fun interviews I've done, and I hope you feel the same after today's discussion. One of the best answers to the Crystal Ball question in the history of SunCast, so be sure to stay to the very end! You can get the free energy storage cost analysis tool Josh alluded to in the episode by going to the Sepi Solar blog, here. Welcome to Episode 88 of Suncast! Did you check out last weeks episode where I give you the chance to join me in helping build Suncast? If not, Listen to it here! From Akeena's IPO and co-founding Green Charge Networks to helping Nextracker build the next generation of hardware-embedded energy storage, Josh and his Enginerds at SepiSolar have done it all. Josh first appeared on SunCast in the Tactical Tuesday Episode #81, where he dispelled myths about battery chemistry and helped us understand the true value of adding storage to a solar project. He's is the CEO/Founder of SepiSolar, a Bay Area engineering services company that has taken a long view on the integration of storage with solar. He was also one of the co-founders of another well-known storage company, Green Charge Networks, which I teased in the Tactical Tuesday episode. The not-so-strange connection between Music & the Solar Industry? Josh’s energy storage career began as a co-founder of Green Charge Networks, which was awarded a $10M grant by the US DOE to deploy 8 micro-grid and utility-interactive solar + energy storage + electric vehicle chargers projects for the purposes of optimizing behind-the-meter electricity usage. After exiting Green Charge Networks (now owned by Engie) in 2015, Josh has gone on to develop grid-connected energy storage and micro-grid projects with NRG’s Station A team and NEXTracker’s integrated energy storage program, where Josh has played many roles in the development of energy storage products and services, including business, finance, policy, project, product, hardware, and software development. Welcome to Episode 86 of Suncast! Since I started SunCast, I've received hundreds of thank-you's, dozens of positive ratings/reviews, and more high fives and pats on the back from industry friends than I can remember. Today, I'm giving you the chance to join me in helping build Suncast even more. As always, thanks again for setting aside THIS time in your day. Welcome to Episode 87 of Suncast! Did you check out last weeks episode with Mike Silvestrini? If not, Listen to it here! 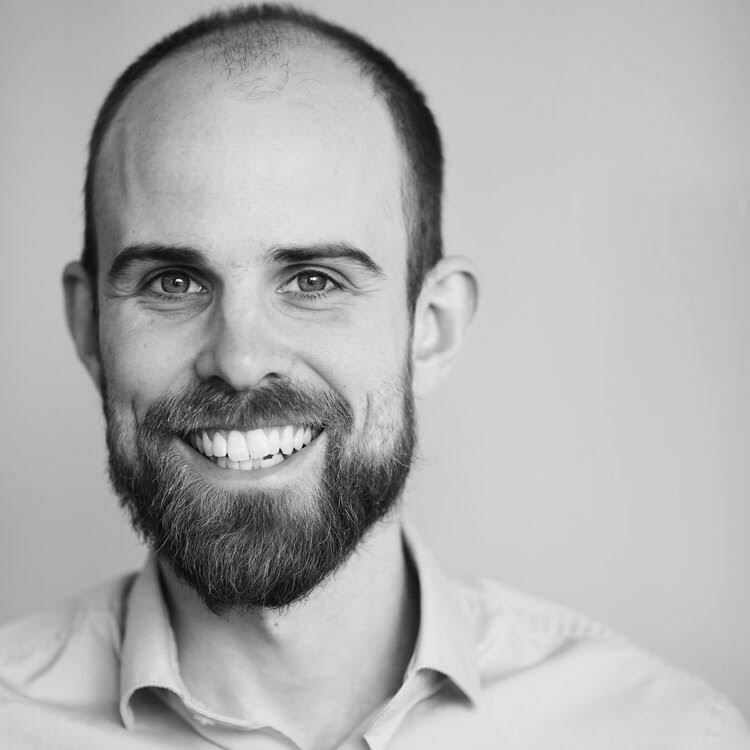 Today on SunCast, we're going to discuss with Rob Andrews how his Canadian startup, Heliolytics, is improving the way operating assets are managed and optimized for long-term yield. Rob is the CEO and co-founder of Heliolytics, a technology company developing advanced inspection tools for renewable energy facilities. Rob has a PhD in mechanical engineering focused on PV system modeling and performance analysis. Heliolytics spawned from a solar energy performance consulting firm he started in grad school in which he worked with solar energy clients globally to develop system monitoring and maintenance plans, optimize plant performance, and integrate new technologies. This episode is brought to you in partnership with Solrates.com, the fast and Free online platform for providing your commercial customers with a credible lease financing proposal. If you have commerical solar projects over $100K value, and you'd like to see how Solrates can help You quickly and easily deliver a financing proposal to your customers, Head over to www.mysuncast.com/SolRates and click on the Request an Invitation button. Welcome to Episode 84 of Suncast! Did you check out last weeks episode with yours truly, me? If not, Listen to it here! I drill down on the ways that you have been losing in your negotiations, in business and life, and the subtle ways you can fix it, and stop missing out on the spoils of your labor. Today's episode is with my first 3-time returning guest, Jason Zook, a mentor and friend who I've learned from a ton over the last 3 years. 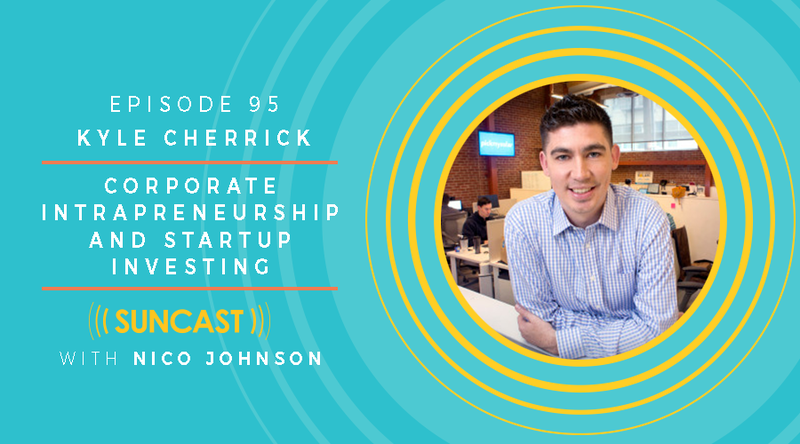 He was most recently in Episode 79 talking about his entrepreneurial journey and creating profitable products that solve real-world problems. But I wanted to have him back one more time to discuss the remarkable ways he and his wife Caroline are very intentional in their philosophy of the notion of work-life balance, or as Jason calls it, Working to Live. The new software tool they use to help balance their finances, budget, planning, and well…life. While Jason isn't a solar expert, I know that many of you out there on your solo entrepreneur path will truly appreciate the sage advice and wisdom he shares. And I also believe you'll want to check out his latest project with Caroline. They call it Wandering Aimfully, and as we teased in the last episode, it's finally launched and open to the public. Would you like to hear more about how you can help ensure the long-term success and growth of this podcast? I am launching an exciting new way for you to partner with me on this journey, and I'll be explaining it to my email subscribers first, starting with the emails going out this week. Next Tuesday I'll have a brief episode specifically dedicated to explaining what this upcoming launch is all about. But for now, I hope your life is enriched with yet another tactical and timely episode. To subscribe to my mailing list, head to https://www.mysuncast.com/negotiate, you'll not only hear the upcoming announcement before anyone else, you'll gain access to a cheat sheet based on the content in last weeks episode. Welcome to Episode 83 of Suncast! Did you check out last weeks episode with Ed Feo? If not, Listen to it here! Today we're going to drill down on the ways that you have been losing in your negotiations, in business and life, and the subtle ways you can fix it, and stop missing out on the spoils of your labor. There's no formal guest today, but instead, we get a virtual guest by the name of Chris Voss, author of Never Split the Difference – possibly one of the best books I've read in a decade. I've personally used the tools I've learned from it to negotiate a 150% fee increase in a contract negotiation, more than once. It's the single most recommended book, by me, to all my business colleagues as well as family & friends, and for good reason. It's changed how I do business and has materially changed my life, and I've been waiting for a good time to share it with you because YOU deserve to have this information in your hands! I've had many many of you email, text, WhatsApp and even come up in person and congratulate or encourage me for SunCast, and the most common refrain is, "Nico, don't stop, what you're doing is great, and it's important." And that encouragement and feedback have been a major reason why I've persevered with this passion project over the last 2.5 yrs and 82 episodes. But, real costs... each month, I spend over $1100 to make sure that the episode is the highest quality it can be, often times flying or driving to interview guests in person. I look forward to sharing more, so join the mailing list now so you don't miss the announcement in the next couple of episodes. Join the mailing list here and receive a free cheat sheet to own your next negotiation. Chris Voss was the FBI’s lead international hostage negotiator and he’s the author of an excellent new book: Never Split The Difference. Think you know what really influences people? Maybe you’ve even read other books on the subject before? Well, you’re probably making a lot of mistakes. Chris has some of the most counterintuitive — and effective — techniques you’ve never heard about. People are reluctant to say “yes” because it makes them commit to something. It makes them defensive. When people say “no”, they feel they’ve protected themselves. “No” is protection. “Yes” is commitment. People worry about what have I just committed to by saying yes. But when you say “no”, you don’t commit to anything. Since you just protected yourself, you have a tendency to relax. People actually become a lot more open if they feel they’ve protected themselves. A lot of people think you get people to say easy “yes”-es so that when the situation gets more difficult, they are more primed to say “Yes”. Ok, well How can I do that? They don’t want to fail, so they will say “No”. Now you can start to find common ground. Playing dumb works. In fact, being helpless works too. Asking “How am I supposed to do that?” is deceptively powerful. It gets them to solve your problems for you and in a way they deem acceptable. Calibrated “How” questions are a surefire way to keep negotiations going. They put pressure on your counterpart to come up with answers, and to contemplate your problems when making their demands… The trick to “How” questions, is that correctly used, they are gentle and graceful ways to say “No” and guide your counterpart to develop a better solution — your solution. By getting the other side to think about your situation it very often gets them to grant concessions. And they’re concessions that they’re okay with and will likely stick to because it was their idea to offer them. List your negatives down on a piece of paper. Figure out your terms and conditions in advance. Do some basic work so when you come up with specific numbers you can back it up. And the common response is to start your reply with “I’m not ____.” You deny their feelings. Boom — you just lost the patient, doctor. They now assume you’re not on the same page. That they can’t trust you. So what does Chris say to do instead? List every terrible thing they could say about you. The fastest and most effective means of establishing a quick working relationship is to acknowledge the negative and defuse it. This is beating your counterpart to the punch on something they will likely use as an attack or counterargument. “That’s right.” When they say that, you know they feel you understand them. That’s rapport. Now emotions are on your side. Now you’re collaborators trying to solve a problem, not warring tribes. Welcome to Episode 82 of Suncast! Did you check out this week's Tactical Tuesday, another great one on Energy Storage with SepiSolar CEO, Josh Weiner! Listen to it here! Josh breaks down calculating the $/kWh of energy storage, plus a useful free tool! Ed Feo, co-CEO of Coronal Energy. As you'll hear, Ed has a fabled history in the renewables industry. Accolades like "Attorney of the Decade" or "One of the 5 most influential people in Renewable Energy" are earned in the trenches, and Ed's been in the deal room more than just about anyone – having worked on hundreds of deals and over $35B in transactions during his 23 yr tenure leading the Project Finance practice at law firm Millbank. When I started my career in the solar industry in 2006, there was one attorney who was routinely heralded as the best, and has been credited with helping establish what many consider the modern era of project finance for solar energy. Yes, he is indeed, a Solar Pioneer, and today I'm honored to spend time with Ed Feo, one of the founders of Coronal Energy, to better understand not just what makes Coronal different, but why some of my close friends just love working for this guy. This episode is brought to you in partnership with Solrates.com, the fast and Free online platform for providing your commercial customers with a credible lease financing proposal. If you have projects over $100K value, and you'd like to see how Solrates can help You quickly and easily deliver a financing proposal to your customers, Head over to www.mysuncast.com/SolRates and click on the Request an Invitation button. Welcome to Episode 80 of Suncast! Did you check out the last Suncast episode? It's with my friend and mentor, Jason Zook! Listen to it here! Today on Suncast, you'll meet James Ellsmoor. James is a social entrepreneur with expertise in sustainable innovation and entrepreneurship in rural, remote and island regions. The last 6 yrs He's been living, working and traveling in over 40 countries coordinating high-profile international renewable energy installations with government, private and nonprofit sectors. He's on the 2017 Forbes 30 under 30 list for Energy and has been leading the efforts of the non-profit Solar Head of State for the last 5 yrs. How James got on the Forbes 30 Under 30 list. How the Carribean is striving to lead the way in Solar. Find James on LinkedIn and Twitter! Welcome to Episode 78 of Suncast! You can check out part 1 of this 2-part series with Paul, here! This week we are rounding out our discussion with Paul Grana, co-founder of the much-loved solar design software, Helioscope. If you missed last week's episode, then you might consider going back to catch it next, as we go over a lot of the foundations and early pivots in Pauls career that led to founding Folsom Labs with his partner Paul Gibbs. 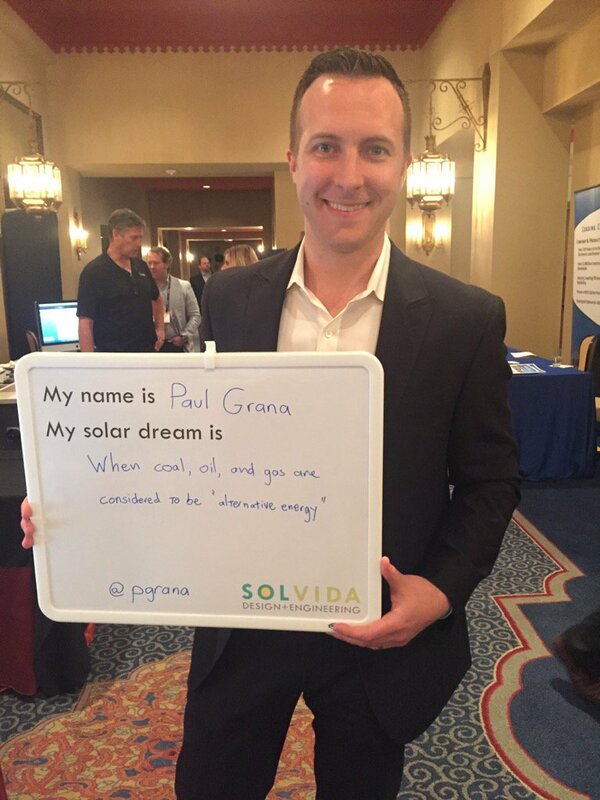 Known as "The Pauls", they have created one of the most successful SAAS companies in the solar industry, and I asked Paul Grana how on earth they manage to grow to >3000 users with ZERO formal salespeople. Welcome to Episode 77 of Suncast! Did you check out the last Suncast episode? It's a Tactical Tuesday with Scott Sullivan! Listen to it here! If you've been listening for the last few episodes, we've been talking about tools that today's leading solar companies are using to grow their business, and today I have the honor to sit down with one of my good friends in the solar biz who, along with his partner, has built arguably the most recognizable software for most of you, especially if you've been doing commercial solar for any period of time. You can check out part 2 of this 2-part series with Paul, here! Back in the Adam Gerza episode, I mentioned how easily 50% of the installers I meet are using Energy Toolbase. I'd be willing to bet that number is actually closer to 80% for today's guest. He hit me with the staggering fact that they have >3000 users! So whether you are or aren't one of the 3000 who already sings the praises of Helioscope from the rooftops, you'll want to hang around for today's episode with Paul Grana to learn more about how and why this software has gotten such traction in the solar market. Welcome to Episode 76 of SunCast! Did you check out my full interview with Scott Sullivan? Listen to it here! As I mentioned in that episode, Scott is a pro who truly understands that your network is your net worth. He has a reach of over 60K in his LinkedIn network alone. As promised I got Scott to do a deep-dive with me on this networking, career and even brand-building tool. Scott Sullivan has built a career on leveraging the value of his connections and honing the skills of sales and relationship building. Listen in to learn from Scott and I as we discuss very specific tactics for setting up your own all-star LinkedIn profile. Be sure not to miss the considerate offer from Scott at the end of today's episode! We look forward to hearing from you. Don't forget to tweet "#breakitdownscott" along with @sully94534 and @nicomeo on Twitter or LinkedIn to have Scott give you a PERSONAL LinkedIn Profile breakdown! Check out my full interview with Scott on Episode 74.